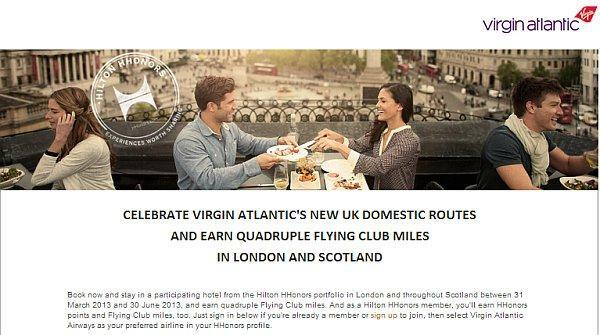 Hilton HHonors has a new promotion for quadruple Virgin Atlantic miles between March 31 and June 30, 2013, at participating Hilton family of hotels in London and Scotland. You need to register for this promotion and access Hilton’s web page for this promotion here. The beauty of having Virgin Atlantic as Hilton HHonors double dip fixed mile partner is the earning rate of 1000 Flying Club miles per stay at full service properties. This is quadrupled to total of 4000 miles per stay during the promotional period. You can later convert these Virgin Atlantic Flying Club miles back to Hilton HHonors at 1 VS = 2 HH. You can consider this as a 6000 bonus Hilton HHonors points per stay in addition to 2000 points that you would usually get by having Virgin Atlantic as your partner and converting them back to points. I have written an article about Hilton’s Double Dip program that you can access here and using Virgin Atlantic as your strategic partner to maximize your Hilton HHonors point earnings that you can access here. This is not bad promotion at all. You would get 8K HH per stay having VS as your double dip partner, 2K HH from the 2nd quarter promo (Daily Grand) for weekend night, and 1K HH Diamond bonus + base points as well. This would be at least 12K to 13K HH per stay. To participate in the offer, you must (1) be a Hilton HHonors™ member; (2) select Virgin Atlantic Airways as your preferred Double Dip® Points & Miles™ partner in your HHonors profile prior to completion of your stay; (3) select Points and Variable Miles or Points and Fixed Miles as your Double Dip Earning Style within your HHonors profile; (4) complete a stay at anyparticipating hotel in the Hilton HHonors portfolio in Scotland or London from 31 March to 30 June 2013 (“the Promotion Period”); and (5) register at HHonors.com/Quadruple prior to checkout. Bonus Mileage: HHonors members choosing HHonors Points and Fixed Miles will earn 10 HHonors Base Points per eligible U.S. dollar spent and 1000 or 200 base miles per stay, as applicable based upon brand at which your stay is completed. In addition, members will be awarded 3000 Flying Club bonus miles for stays at Waldorf Astoria, Hilton, DoubleTree, Hilton Garden Inn or 600 Flying Club bonus miles for stays at Hampton Inn. HHonors members choosing HHonors Points and Variable Miles will earn 10 HHonors Base Points plus 2 Flying Club base miles per 1 USD spent. In addition, members will be awarded 6 Flying Club bonus miles per 1 USD spent. HHonors members will receive the selected bonus only for nights completed during the Promotion Period, regardless of a check-in date before the Promotion Period begins or a check-out date after the Promotion Period ends. There is no cap on the miles to be awarded during the Promotion Period , subject to the above-noted per-stay caps. This offer is not applicable to group bookings and may not be combined with any other select promotions, discounts or offers. Please allow six to eight weeks from completion of your stay for points or miles to appear in your HHonors account. Next articleAny Bright Spots On Hilton’s New Award Category List?